Providing the correct and consistent answer all the time regardless of employee or knowledge-level is important to maintain a professional appearance to your customers. Additionally, speed in sending standard answers is key to wading through the masses of requests in growing service desks. OTRS templates offer you a variety of ways to deal with standardizing communications and help to pre-define texts so that the customer always receives the same level and quality of service from all agents. Use this screen to add templates for use in communications. A fresh OTRS installation already contains a template by default. 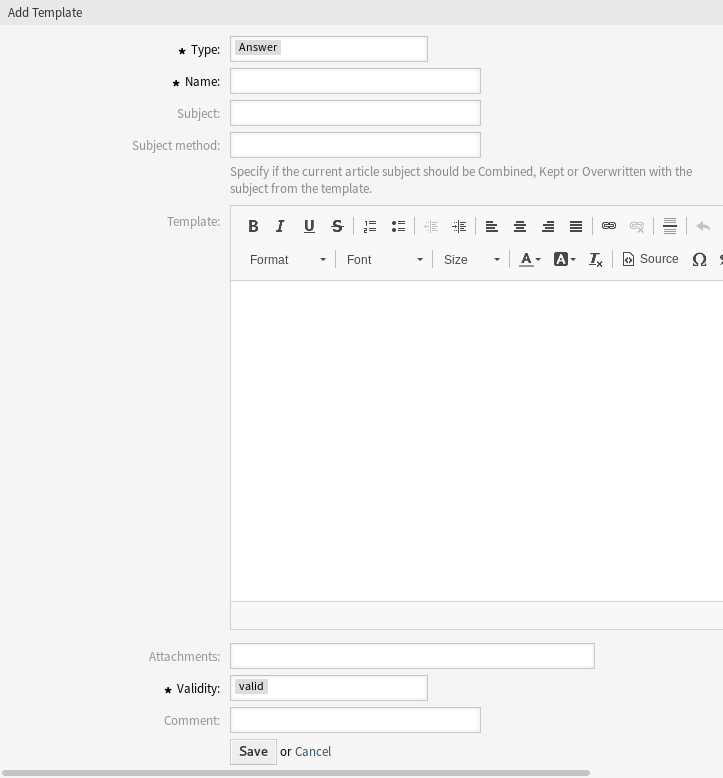 The template management screen is available in the Templates module of the Ticket Settings group. To add attachments to a template, it needs to create the attachment first in the Attachments screen. Click on the Add Template button in the left sidebar. Click on a template in the list of templates. Click on the trash icon in the list of templates. If several templates are added to the system, a filter box is useful to find a particular template by just typing to filter. To be used as a ticket response or reply. To be used for new phone or email ticket. To be used for writing an email to a customer user. To be used to forward an article to someone else. To be used to create internal notes. To be used for inbound and outbound phone calls. To be used in process management. The subject of the email sent to the users. 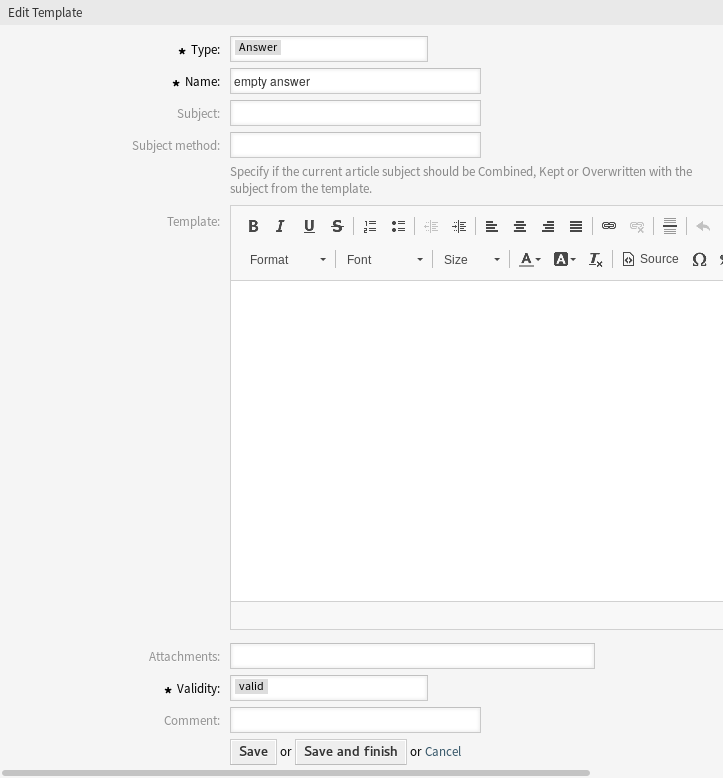 The template subject will be added after the current article subject. The current article subject will be kept. The current article subject will be replaced with the template subject. The body of the email sent to the users. It is possible to add one or more attachments to this template. Attachments can be added in the Attachments screen. 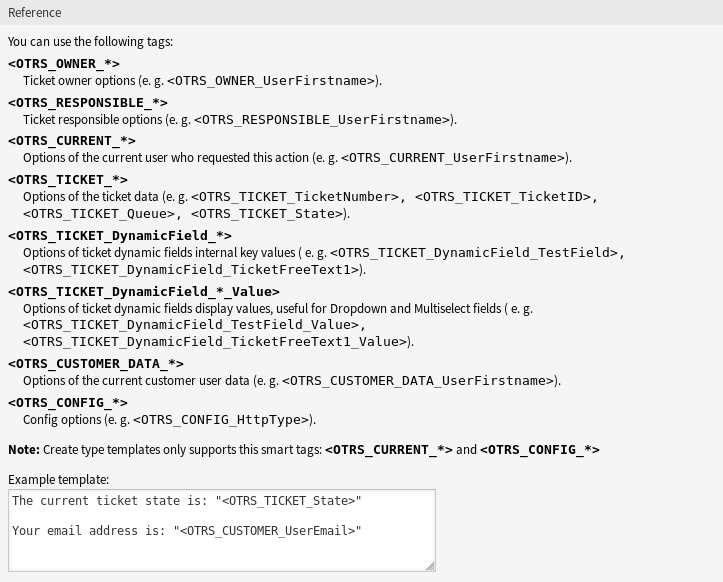 For example, the variable <OTRS_TICKET_TicketNumber> expands to the ticket number allowing a template to include something like the following.